Homespun Stitchworks..... For the love of vintage: Vintage French monograms with a satin stitch tutorial. Vintage French monograms with a satin stitch tutorial. As you know I simply love vintage French monograms when I can find them. 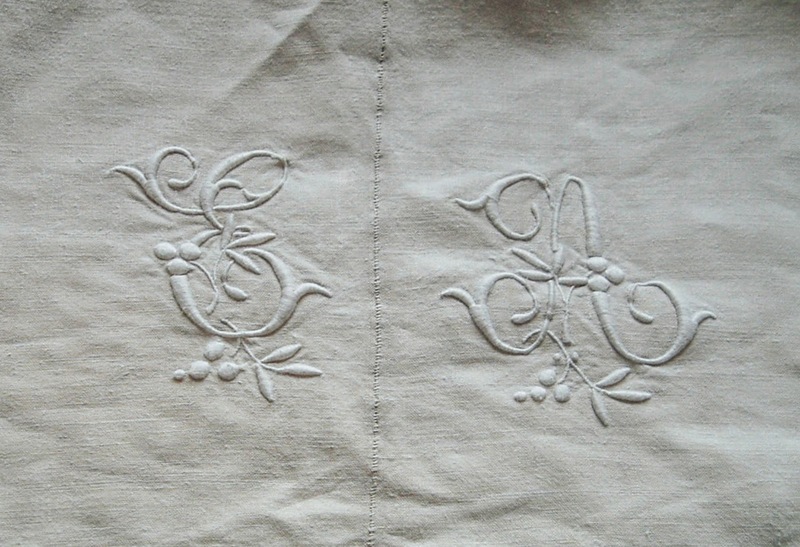 When buying a vintage French linen sheet I try and get one with our monograms on, if there is a particularly gorgeous sheet and the monograms are stunning but not ours, I still buy it and sell the monogram on. In addition to that if I can find some original French monograms that have never been attached to anything, all the better.... all that needs to be done then is to stitch it to what ever you like. A pillow case or cushion or even a picture. I have been asked several times 'how to attach them' to your work. The best and most accurate way is satin stitch. So I have found a video on raised satin stitch so that you can either just do the top layer, which is the satin stitch over your monogram find OR you can draw your own design and this tutorial shows how to make the satin stitch raised. I hope you enjoy the video done by Mary Corbett. It is clear and concise and I think easy to follow. I have recently bought some wonderful original French monograms so all I will do is position them on my work and then satin stitch over the top of them. If I would like to add say a little design around them I would draw a flower and use the whole method shown in this You Tube video. I hope you will all find this useful and I promise you it is an easy stitch and looks stunning when complete. This is a great tutorial for satin stitch and also showing you how to make it raised as well. This picture is sideways! sorry!.... But you can see the French box of A monograms ready to attach and do white thread satin stitch over. No need to do the raised part. American Lighthouses.... I love them! Turn of the Century silver brooch find! Off to a vintage fair today! Off to America again this year! Time for a French Linen sort out!